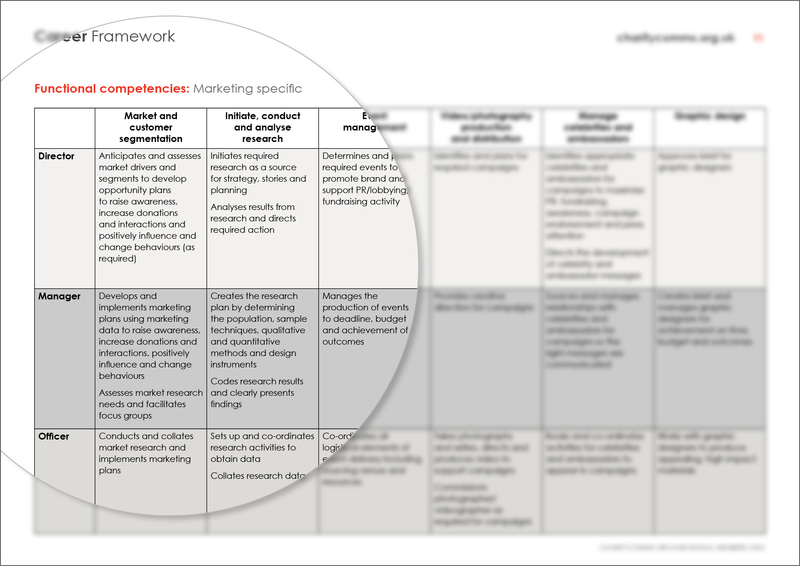 What is the CharityComms Career Framework? This is a competency framework that provides a guide to the skills, knowledge and personal attributes which communications specialists in the charity sector need to perform their roles to best practice standards. Developed exclusively as a free resource for our organisational members, the CharityComms Career Framework can be used by communications professionals for their own career development and by managers for their teams. It is our intention that the Framework will also help to raise the profile of the charity communications sector, and illustrate the importance and professionalism of our work to a wider audience. How has this been developed? This Framework has been developed through: research of communication, management and leadership competencies; a review of communication job specifications; and feedback from CharityComms members on what they do in their job role. The Framework applies to all communications specialists from officer to director level. The framework can be used to help individuals understand what is required of them and what competencies they must develop to move sideways or upwards. The Framework helps employees and managers be clear about the skills and behaviours needed to achieve job specific objectives and outcomes. It can be used to assess individual and team performance and plan development. Measurement against the Framework will identify individual and group training and development needs. Competencies can be used to frame job descriptions, interview questions or assessment centres/tests. The use of competencies makes sure recruitment is fair and equal. How do I access a copy of the Framework?